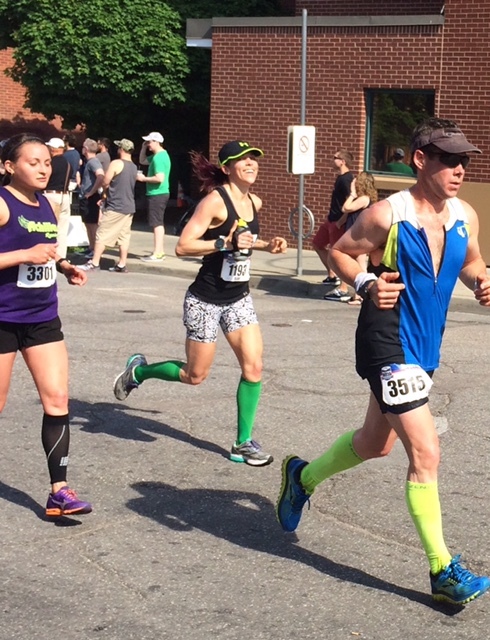 On Sunday, May 29th, 2016, I ran the Vermont City Marathon in Burlington, Vermont. It was my second ever marathon. My first ever marathon was Vermont City 2015. I returned this year for redemption, chasing a Boston Qualifier after experiencing a one second heartbreak on my first attempt. This race was not lacking drama, and I'll not soon forget the day. In fact, I have so much to say about it that I will have to tell the tale in two parts. Feel free to skip the boring stuff. Becca and I began our Saturday morning with an easy shakeout run on our familiar Charles River paths in Cambridge, MA. Accompanied by my fantastically supportive sister, Carly, we set out on our northward trek to Burlington. We stopped midway through the ride in White River Junction for car fuel, human fuel (lunch), and maple scented scratch tickets. 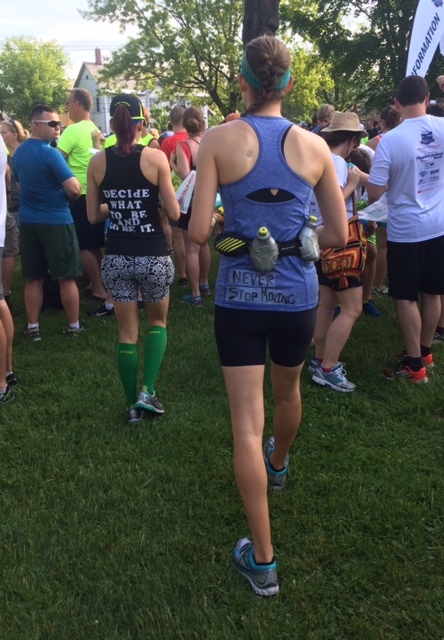 I checked my email and re-read a note from the race organizers warning runners of the forecasted heat and humidity and outlining preparations being made to enhance runner support on the course. I guzzled water. Before checking in at our AirBNB, we visited the Sport & Fitness EXPO at the Sheraton Hotel and Conference Center in South Burlington. The pre-event was crowded with race volunteers, officials, vendors, and runners. I made a beeline for the SkiRack pacing table, where the pace team leaders (Vermont City Marathon offers led pace groups for 3:15, 3:30, 3:45, 4:00, 4:15, 4:30, 4:45, 5:00, and 5:30) were available to answer questions. Several runners with furrowed brows were already nervously chatting at the table when I approached, all appearing to have the same weather-related pacing questions. This being only my second marathon, I wasn't sure what to expect from myself on a day that was projected to be twenty degrees hotter than anything I'd trained in. Deep down, I probably already knew what the pacers were going to say, but I needed to hear advice spoken out loud from someone with experience. "How much should I expect to slow down? How do you approach a goal time in these conditions?" I asked, hoping so hard that the answer would be something along the lines of, "It'll be no big deal! You're good to go! Stick with your plan, man!" That was not the case. "Based on the projected temperature, I'd expect pace to slow down by 10-15%." For me, that would mean giving up the BQ dream. He went on to offer some advice, "By the time you come off the Beltway, you'll know where you stand. You could stick with the pace group through the Beltway and reassess how you feel." I added my name to the list under the 3:30 pace group, feeling informed, but no less anxious. Next, we picked up our bibs and clear bags for race day gear check. We had Carly to carry our finish line items, so neither Becca nor I used the gear check service, but it was nice that the race offered it. We wandered the expo and tasted a beer, then dropped our bags off at our AirBNB in Winooski. Dinner was American Flatbread pizza in Burlington. They made me a fantastic vegan pizza. Back at our AirBNB, Becca and I assumed Legs Up The Wall position while she read a book and I watched the New England Revolution beat the Seattle Sounders 2-1. We climbed in bed to sweat through the night with no fans. All three of us were awake and out of bed before alarms went off at 5:30 a.m. I swallowed my peanut butter and banana on English muffin and shoved Vega endurance gels into my shorts pockets before pinning on my race bib. We left the house at 6:50 and found parking easily on a side street a few blocks from the start line. The starting area in Battery Park was buzzing. We hopped in line for port-a-potties (I'm pleased to report there were plenty). The Vermont City Marathon & Relay, now in its 28th year, offers a Marathon, 2-person Half Marathon Relay, and 3-5 person Team Relay. Because of the events that unfolded later in the day, I'm not entirely certain how many runners toed the start line, but I believe I heard there were somewhere around 2,600 marathoners. We snapped a nervous pre-race photo. As we lined up in the corrals, I located my college pal, Laurel. Thanks to the wonder of social media, Laurel and I had connected a few days before the race when we discovered we were both running the race and aiming to run about the same pace. We exchanged nervous hellos, inched ourselves up toward the 3:30 pace group, and caught up on the past 9 years in the five minutes before the national anthem played. The temperature outside was already creeping up over 74 degrees. At 8:00, the pushrim racers were off and rolling. At 8:03, the horn blared and a couple thousand GPS watches beeped as their attached runners crossed the starting line. Though I'm typically an obsessive (and annoyingly ignorant) headphone wearer, I opted to leave my music in my pocket so I could engage with my surroundings. I grinned and did my best to weave around folks to stick with the pace group. Like last year, it was pretty much shoulder-to-shoulder for the first mile. We looped through downtown Burlington and up Church Street, which was pulsing with crowd support. I spotted the amazing Lauren on Beech Street at mile 1.7, furiously wielding signs for Laurel and me. Did I mention I have great friends? After crossing back over the start line, this time in the opposite direction, we headed down a highway ramp north onto the Burlington Beltline (VT-127). The Beltline closes down just once a year for the marathon. Last year, I remember reigning myself in on this flat, open out-and-back stretch of the race. This year, I felt the sun beating down and the heat radiating off the asphalt. There was no shade. A smile and wave from Becca as we passed one another in opposite directions refreshed my energy. After a climb back up the off-ramp from the Beltway, we returned to downtown and shade and sprinklers. Towards the end of the Beltway leg, I'd begun chatting with Kailey, who had traveled all the way from Ohio to run her third marathon. She was aiming for a BQ, too. She was a good story teller, and listening to her talk about running helped miles pass. Unlike all the races where I'd worn headphones and stayed laser focused, I was enjoying camaraderie. I spotted Carly just before mile 10 and felt energized by seeing her. We turned a corner and ran down Church Street. I heard my name and looked over to see Lara, who was here to cheer on her husband, Dave, in his first marathon. There were some nice downhill stretches and a band playing on Pine Street. The same man from last year was banging hammers on an upturned Rubbermaid container in a small neighborhood loop. These few miles went by, but they were starting to feel like work. I decided to ease off a little and let the pace group get ahead of me, but kept them in view. Laurel and I found each other again and chatted for a stretch before she, too, drifted ahead. I crossed the half marathon timing mat in the parking lot of Oakledge Park at 1:44:30. Still on pace to finish in 3:30, but I was starting to wrestle with my own doubts. I felt fine, but really hot, and my watch told me my heart rate was hovering around 180. I had taken water from every aid station and was feeling quite full, but still thirsty. I wondered seriously whether I was orchestrating myself a trip to a medical tent by sticking to the plan. It was time to decide: Barrel on and chase the dream, or check my hubris and ride out the storm?